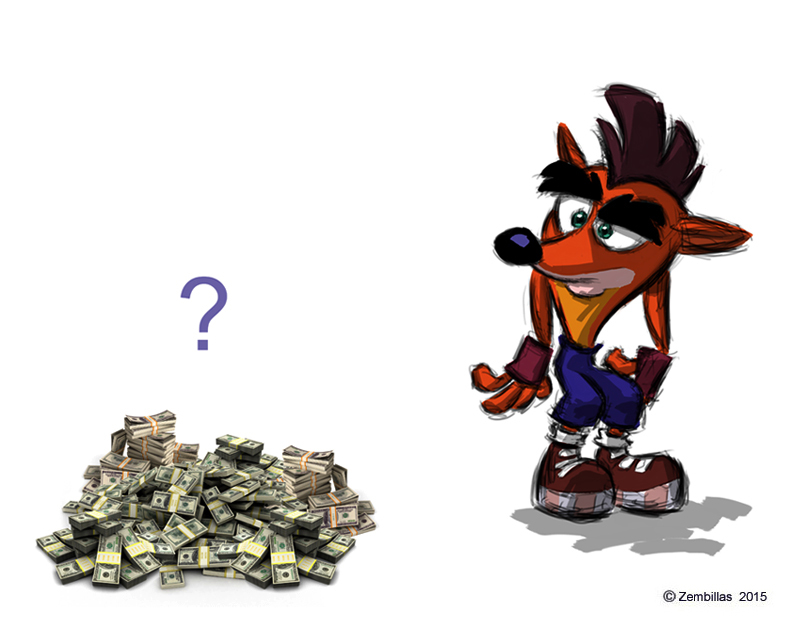 How many of you wonder who made the big bucks on Crash? Was it Naughty Dog? Universal? Sony? Activision? Others in between? Who wound up with all that Crash cash? for game developers to create unqiue IP's for the Playstation. demographic, which also helped boost sales. helped them develop future projects. Crash, mysteriously then, was given away..
back, since they know the amount of profit that can be made off of him. back via negotiations with Activision themselves, acording to various articles over the last year or two, to help market the PS4 further. return from the Bandicoot himeslf and the person interviewed mentioned a return in 2016. I only know that because it was posted in the comments. Because the video was taken down. Hey! Hello!.. Big fan here! I'd like to comment in a more appropriate subject, but I guess here I'll get better your attention. Me and a group are working in a campaign for Crash Bandicoot be added to Super Smash Bros. for Nintendo 3DS/Wii U as DLC, since there's a open ballot for any videogame character, and just as Sonic, Crash was a big part of Nintendo competition. ~I'd like to know if you're interested to check it out on our Official Twitter ( https://twitter.com/Crash4Smash ) , and say if you support; Would be amazing; Thank you! Hey Charles! It's Pat again! Sadly, these aren't in full color but awesome nonetheless and more is to come. Charles, is this what the Willy Wombat pitch bible looks like that you own? I remember you mentioning that it included Joe Pearson's Tiny and the Komodos who were pushed to development of Crash 2? Is that right? I'd love to see it sometime soon! Also, good luck with the new school year! I hope you'll enjoy teaching a new wave of students who are entering the animation industry and having successful careers! joaocwtheguy07 I'm pretty sure I put this on the blog at some time. Anyway the link is above and I hope it works out. I'm not on Twitter and don't have much of a presence on Social Media at this time. Maybe some of the heavyweight Crash fans here can pick up on it. Good luck Crash I hope you break out! Pat the images you posted from David Siller's archives are not from the original Willy Wombat bible. Also all of the artwork on those pages was done by me. I'm positive that the text is Joe's as he did all the creative writing development on Willy / Crash. The original production bible focuses on more technical subjects like gameplay concepts, outlines and structures of the levels, info about PlayStation, stuff like that plus some art. It has all the BG design drawings and all the color BGs which I painted plus I think some BG color work from Gregg Davidson. It's not a pitch bible, it's a production bible which is different. The original is still in good shape considering it's more than 20 years old. I'll do my best at some point in the future to showcase it. Right now it's now possible. Too much going on. Do you know the name of this musical instrument? Charles, can you give me some hints how to become as good as you? I would really love it. Hi LucyLoveMeggie CZ. Yes I'll teach you. I'll be making educational videos soon. They'll be helpful and you'll learn to be a better artist.